The holidays are a magical time. Getting together with family and friends, sharing home-cooked meals, and revisiting timeless traditions can make the season especially exhilarating for young and old alike. But the holidays can also be difficult if you have recently lost a loved one. Memories of special times you have shared together can be particularly painful to revisit without the company of the friend or family member who has died. Of course, it is normal to feel sad or lonely during your grief journey, but sometimes the additional anticipation and expectations of the holiday season can be overwhelming. You may not feel like spending time around large groups of people, or you may find it too difficult to feel festive amidst carolers and partygoers. While nothing can replace the presence of your loved ones during the holiday season, finding ways to cope and adjust can help you look forward to and enjoy the coming season without them. • Acknowledge your feelings: It is okay to let others know that you are feeling sad and that you miss the person who has died. Surely, others who were close to your loved one are feeling the same way. Talking to each other about how much your family member enjoyed making homemade hot chocolate, or sharing memories of past celebrations together is a wonderful way to celebrate that person. Who knows? Retelling the story of the year Grandpa locked the keys in the car with all the holiday gifts may just become a new family tradition. • Dedicate a tradition: Perhaps your brother fried the Thanksgiving turkey out in the yard every year, or your mother made oyster stew for New Year’s Day. Anticipating those tasks without the people who made them special can seem like a mountain you just can’t climb this year. Instead, talk with your family about dedicating the tradition to your loved one. Serve oyster stew using a new recipe and offer a toast to your mother, dedicating future stews in her honor. Train a young person in the art of turkey basting and dedicate the new chef’s efforts to your brother. You can even reference your “annual dedication” in your invitation to all those joining the fun. • Start a new tradition: Think about the things your loved one enjoyed and incorporate them into new traditions. If your Dad loved watching football, plan a family touch football game outside after the big meal. If your niece or daughter collected reindeer for her tree, assign a family member to choose a new reindeer ornament to add to the Christmas tree each year in her honor. Sharing new traditions can be a lovely way to continue inviting your loved one into each other’s memories year after year. • Establish a memorial: There are many organizations and people in need at this time of year. Spending time with the elderly in nursing homes, donating your grocery list to the local food bank or setting up an annual donation to your loved one’s favorite charity in their name can be a welcome way for you to celebrate your loved one with your community. • You may simply light a candle in honor of your loved one and have it continue to shine bright through the festivities. Anything you can do to remember your loved one but continue to carry on can help you! 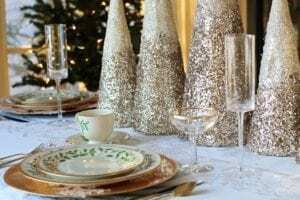 Although the empty seat at the table can never be filled in quite the same way, giving yourself permission to approach the holiday season in new ways may give you the strength and comfort you need to enjoy this time of year now and in the future.